HEATTEC Hot Runner Heaters are made of nickel chrome resistance wire placed inside chrome nickel steel tube filled with mgo powder and compacted for faster and efficient heat transfer. The heaters are annealed to acquire malleability for bending into any shape. Hot runner heaters with built in thermo couple are also available. Hot runner bushes are produced with hot runner heaters of different cross section with inner brass and outer stainless steel cover. Build in Type “J” (or) “K” Thermocouple. 3.2mm X 1.8mm, O 1.8mm, 3.3mm, 3.7mm. Available as per customer’s specifications. Thermocouple if required Specify Type “J” (or) “K” Grounded (or) Ungronded. Number of coil in L1, L2 & L3. 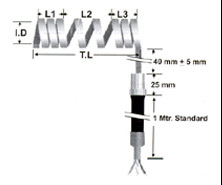 Coil total Length T.L, L1, L2, & L3. Connection lead option, lead length and lead orientation. Drawing or sample for special type configuration.